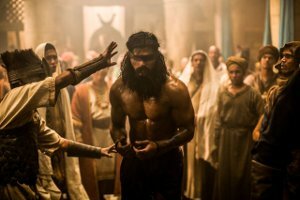 The famous story of Samson and Delilah from the Bible comes to the big screen again, this time shot here in the Western Cape and starring some home-grown talent. After losing the love of his life to a cruel Philistine prince, a young Hebrew with supernatural strength seeks revenge, and to defend his people, eventually sacrificing everything to avenge his love, his people, and his God. Screenplay Jason Baumgardner, Galen Gilbert, Timothy Ratajczak, Zach Smith, based on the story in the Bible. Violence Frequent, moderate impact physical and emotional violence with scenes of domestic violence e.g. raging battles with sword fights, bow and arrow shooting, punching and kicking during battle. Prejudice Mild impact, prejudice of racial discrimination e.g. slavery and oppression of the Hebrews by the Philistines. Comments Themes are complex and mature of slavery, poverty, a prophecy, a suffering people, tormented and tortured by their captors, hunger and starvation, belief in God, master/slave relations, God&apos;s miracles, faith, hope, secrecy, the Philistine people, killings, bad vs good, religion, rebellion, the Hebrew tribe, love, deception, betrayal, Samson&apos;s great strength and might, marriage, retaliation, loyalty, sin, the power of God, victory, misuse of power and oppression, The Living God vs the god of the non-believers, shame, honour, dishonour, threats, fear, destruction, redemption and good triumphing over evil. 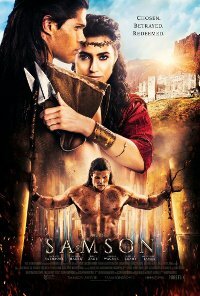 The themes are based on the Bible story and ancient historical events about the great Hebrew warrior, Samson who was betrayed by the woman he loved, who tricked him into revealing the secret behind his might and strength, which led to his downfall. Children under the age of 13 years, may find the material to be confusing, distressing and upsetting to their sense of security and well-being and it might cause them psychological and emotional harm.